Sky has unveiled the latest version of its Now TV service called Now TV Combo, which offers triple-play services without any contract in addition to a Now TV Smart box which includes a Freeview tuner for the first time. The service will be available from July and will be available without any contract, meaning you can pay for services on a monthly basis without any longer term commitment. Prices start from £9.99 but increase depending on which of the four streaming pass are selected, as well as depending on the specific internet and fixed telephone packages. Sky has also unveiled the latest version of its Now TV box. The Now TV Smart box works as a Freeview tuner in addition to offering full access to Sky's Now TV streaming service. The box will cost £39.99 if you buy it as a standalone product, but is included for free as part of the triple-play Now TV Combo. The existing Now TV boxes already offered live streaming of 35 of Sky's own Sports, Cinema, Kids and Entertainment channels over the internet, but the new box will add the ability to view Freeview's 60 channels through digital terrestrial television broadcast (ie through an aerial), as well as allowing users to pause and rewind live TV. Frustratingly the new Now TV box will not offer the ability to record live TV. A spokesperson from Sky told us this was in order to keep the cost of the box to a minimum. The box itself is a modified box from Roku which allows for streaming of up to 720p, depending on the speed of your home internet connection. 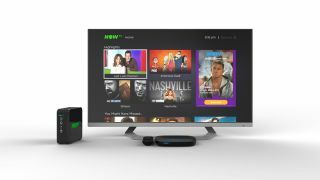 Sky boasted that these new boxes offer 50 apps including all of the major UK broadcaster's streaming services, though the likes of Netflix and Amazon Prime video continue to remain absent. With more than a third of UK home's currently using Freeview as their only TV source according to Strategy Analytics, Sky has a significant market to sell its Now TV services to.